About the Editors and Contributors; Acknowledgments; Preface, Stephen Kotkin; Maps; Introduction, Bruce A. Elleman, Elisabeth Koll, and Y. Tak Matsusaka; Part I. Competing Railway Imperialisms; 1. The Chinese Eastern Railway: From the First Sino-Japanese War until the Russo-Japanese War, S.C.M. Paine; 2. Japan's South Manchuria Railway Company in Northeast China, 1906-1934, Y. Tak Matsusaka; 3. Sino-Soviet Tensions and Soviet Administrative Control over the Chinese Eastern Railway, 1917-25, Bruce A. Elleman; 4. Railway as Political Catalyst: The Chinese Eastern Railway and the 1929 Sino-Soviet Conflict, Felix Patrikeeff; Part II. Competing Railway Nationalisms; 5. Technology Transfer in Modern China: The Case of Railway Enterprises in Central China and Manchuria, Chang Jui-te; 6. 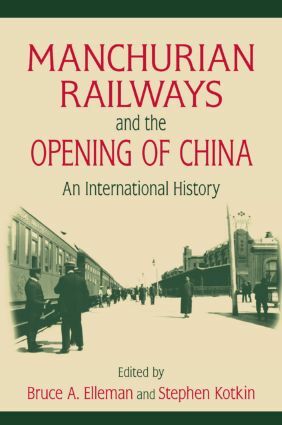 Chinese Railroads, Local Society, and Foreign Presence: The Tianjin-Pukou Line in pre-1949 Shandong, Elisabeth Koll; 7. Railways in Communist Strategy and Operations in Manchuria, 1945-1948, Harold M. Tanner; 8. Return of the Chinese Changchun Railway to China by the USSR, Zhang Shengfa; Epilogue: Rivers of Steel: Manchuria's Railways as a Natural Extension of the Sea Lines of Communication, Bruce A. Elleman; Selected Bibliography; Index.